Blackmar-Diemer Gambit - Chess Gambits- Harking back to the 19th century! The Blackmar-Diemer Gambit is a very controversial gambit starting with 1.d4 d5 2.e4 dxe4 3.Nc3 intending 3...Nf6 4.f3. Blackmar's original idea, 3.f3, is ineffective because of 3...e5, so Diemer improved upon the idea by interposing the knight moves 3.Nc3 Nf6, so that if 4.f3 e5? !, 5.dxe5 hits Black's knight on f6. It can also be used against the Scandinavian Defence (1.e4 d5 2.d4). Some may argue that technically the Blackmar-Diemer doesn't start until 3...Nf6 4.f3 but I have chosen to start with 3.Nc3 so as to be able to provide coverage of Black's alternatives to 3...Nf6. As an aficionado of the Göring Gambit, the Blackmar-Diemer has attracted me partly because it is essentially a mirror image of the Göring. Less impressively, the position after 3.Nc3 Nf6 4.f3 exf3 5.Nxf3 is also a Scandinavian "Banker" (1.e4 d5 2.exd5 Qxd5 3.Nc3 Qd8 4.d4 Nf6 5.Nf3) where White is missing a pawn on f2! However, one of White's ideas is that the f-file can become a major avenue of attack, and as so often happens in the Göring, in the Blackmar-Diemer, too, White often ends up targeting Black's weak point on f7. White aims to secure a lead in development and attack Black down the e and f-files. White often castles kingside to bring a rook to the f-file immediately, combined with Qe1-h4. An alternative approach is to castle queenside, which helps to reinforce the d4-pawn and increase the threat of d4-d5, while White can also advance the g and h-pawns more freely with the king over the other side of the board. A common theme is that if Black places the c8-bishop on f5 or g4, then White harasses the bishop with h2-h3, g2-g4 and Nf3-e5, and then follows up with h3-h4-h5 in many cases. While I believe that the Göring Gambit is probably fully sound, I'm not so sure about the Blackmar-Diemer. There are a few lines where I think Black may well be able to get the edge with precise defence. Although I've seen databases where White gets a whopping plus score with it, in the Chesslive.de database White's score after 3.Nc3 is, as of February 2017, an ordinary 54%. For comparison, the Queen's Gambit (1.d4 d5 2.c4, as opposed to 2.e4) is scoring 58% for White. However, the resulting positions in the Blackmar-Diemer can provide a lot of fun. If you're interested in giving it a go, I suggest checking out the illustrative examples and lines and deciding for yourself if it's worth the risk. Black's most important alternative at move 3 is the so-called Lemberger Counter-Gambit, 3...e5, against which 4.dxe5 leads to equal endgames with few winning chances for either side, although Black's practical chances are probably a little better than White's. Instead, White does better to try and unbalance the position and persist in sacrificng a pawn for compensation. 4.Nxe4 is probably the most reliable method, intending 4...exd4 5.Nf3 with Scotch Gambit-esque positions, or 4...Qxd4 5.Bd3. 4.Nge2 is another possibility, although in that case 4...Nc6 is quite strong. 3...Nc6 is playable, though after 4.d5, Black generally ends up with a rather passive position. 3...c6 can lead into Blackmar-Diemer territory after 4.Bc4 (4.f3 is met by 4...e5) followed by 5.f3. 3...e6, however, should probably be met by 4.Nxe4 transposing into the Rubinstein variation of the French Defence, since 4.f3 can be met by the awkward 4...Bb4. After 3...Nf6, White doesn't get very far with 4.Bg5, and so should prefer the main line with 4.f3. Then Black can consider 4...Bf5, the Vienna Defence, which allows White to charge forward with the kingside pawns after 5.g4, but this leaves White's kingside weak, so White probably does best to persist in sacrificing a pawn with 5.fxe4 Nxe4 6.Qf3, after which White can get sufficient compensation. 4...c6, the O'Kelly Defence, is quite challenging, since 5.Nxe4 gives Black a few reasonable equalising options including 5...Nbd7 and 5...Nxe4 6.fxe4 e5 7.Nf3 Be6, and 5.fxe4 runs into 5...e5. Therefore White should prefer 5.Bc4, whereupon 5...exf3 6.Nxf3 Bf5 transposes into the Ziegler Defence. Black can also try 5...b5!? (Short-Bareev, Sarajevo 2000) whereupon White can improve over Short's play and get enough compensation for the pawn, but has to play accurately for a few moves. With 5.Qxf3 White sacrifices a second pawn, but the move is rather dubious. If Black simply declines the second pawn, say, with 5...c6, then White is probably worse off than after the knight recapture, while the traditional "book" recommendation, 5...Qxd4 6.Be3 Qg4 7.Qf2 e5, is favourable for Black. Mark Nieuweboer's preference 6...Qh4+ 7.g3 (taking the g3-square away from the white queen) 7...Qb4 may be even stronger. However, White's score in the databases is quite good, suggesting that the line offers practical chances. 5...Bg4 is the most popular of Black's 5th-move options, pinning the f3-knight and weakening White's control of the centre, but it is not one of the more theoretically challenging options. White generally kicks the bishop immediately with 6.h3, which is quite a useful pawn move as it also prepares g2-g4. Then after 6...Bxf3 7.Qxf3 c6 (6...Nc6 runs into 7.Bb5) White chooses between the solid 8.Be3, defending d4, 8.Qf2, and the bolder 8.g4! ?, which offers the sacrifice of a second pawn at d4, which Black probably does best to accept, since if Black declines it, then White has few problems getting enough compensation for the pawn. Instead Black can retreat the bishop with 6...Bh5, whereupon 7.g4 Bg6 8.Ne5 usually follows. White will follow up with Bf1-g2 and h3-h4 in most cases, threatening h4-h5, and White's pressure provides sufficient compensation for the pawn. Other 5th moves for Black are not too challenging, e.g. 5...Nc6 6.Bb5, 5...Qd6 6.Ne5. This is generally known as the Euwe Defence and it is solid but rather passive. Play usually continues 6.Bg5 Be7 and White can choose between 7.Bd3 and 7.Qd2. I think 7.Qd2 is the more promising of the two options, since I'm not sure about White's compensation in the 7.Bd3 Nc6 variation, counterattacking against d4, where White has to either spend a tempo with 8.a3, allow the exchange of the important d3-bishop with 8.Qd2 Nb4, or boldly sacrifice a second pawn with the Zilbermints Gambit, 8.0-0, which is dangerous but most likely insufficient. After 7.Qd2, preparing to castle queenside, White is probably able to get enough compensation. This is known as the Gunderam Defence, as Gerhart Gunderam played and analysed this defence extensively and was also pretty objective in his coverage, unlike many other sources on the Blackmar-Diemer Gambit. The most usual response is 6.Ne5, preparing g2-g4 hitting the bishop on f5, whereupon 6...e6 7.g4 Bg6 is similar to the variation with 5...Bg4 6.h3 Bh5 7.g4 Bg6 8.Ne5, but White's h-pawn is on h2 rather than h3, which doesn't make much of a difference to the objective assessment of the line. Black has a few wilder, but probably unsound, options such as 7...Be4!?. The hardest line for White to crack is 6...c6 7.g4 Be6! ?, which is pretty solid. White's main alternative is to exchange off the f5-bishop with 6.Bd3, but after 6...Bxd3 7.Qxd3 c6 it is not clear if White can get enough compensation for the pawn. This is generally known as the Bogoljubov Defence, although the main stem game saw Bogoljubov on the white side against Diemer. The idea is to fianchetto the king's bishop and put pressure on d4. White's most common response is to launch a quick kingside offensive with the Studier Attack, 6.Bc4 Bg7 7.0-0 0-0 8.Qe1, but after 8...Nc6 9.Qh4 Bg4, White's attack is probably insufficient. Hence a lot of attention has shifted to the "Long Bogo" with 6.Bf4 intending Qd2, 0-0-0, Bh6 and a h-pawn hack. If Black tries to delay kingside castling, then White can generate tricks down the e and f-files, so Black does best to head into the main line with 6...Bg7 7.Qd2 0-0 8.0-0-0, and aim to generate enough counterplay on the queenside to offset White's kingside play, making good use of the extra pawn. A key idea of developing the bishop to f4, as Christoph Scheerer has noted, is the d4-d5-d6 push, although note that in the line 8...c5 9.d5 a6, White is probably better off completing development with 10.Be2 rather than the rather hasty 10.d6. White gets attacking chances in all lines, but it is not clear if they are sufficient- in particular Mark Nieuweboer's suggestion 8...a5! ?, causing queenside disruption immediately, is hard to crack. This is known as the Ziegler Defence, although Gerhart Gunderam contributed most to the theory of the line. White has a deviation in 6.Bd3 Bg4, whereupon White can sacrifice a second pawn with 7.h3 Bxf3 8.Qxf3 Qxd4, or play more conservatively with 7.Be3, although it is not clear if this is sufficient to give White enough compensation. The main line is 6.Bc4 Bf5, which can also arise from 4...c6 5.Bc4 exf3 6.Nxf3 Bf5. Then the standard line 7.0-0 is insufficient after 7...e6 8.Ne5 Bg6 (not 8...Bxc2?! 9.Nxf7!) and 8.Ng5 Bg6, so White's best bet is probably 7.Bg5, intending Qe2 and queenside castling. 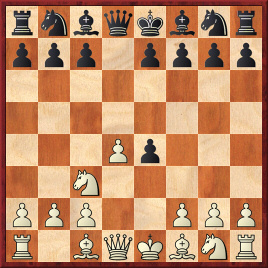 Then if Black goes kingside, e.g. after 7...Nbd7 8.Qe2 e6 9.0-0-0 Be7 10.Rhf1 0-0, then White can attack Black by pushing the g and h-pawns. Black also has 7...e6 intending 8.Qe2 Bb4, preventing White from safely castling queenside, but then White has Lev Gutman's suggestion 8.Nh4, which may give White enough compensation for the pawn.